The western hub has been ranked as having the worst congestion in the country. BUSINESSES SAY THAT traffic snarls in Galway city – which has been ranked as suffering the worst congestion in Ireland – are stifling trade as the local economy bounces back. Galway Chamber president Maurice O’Gorman added that members of the organisation are reporting “onerous” delays getting to and from work every day, while foreign firms have bypassed the city for further investment because of traffic concerns. Earlier this year, data published by transport analytics outfit Inrix showed that Galway has the worst congestion problems in Ireland. It was the only Irish town or city monitored by Inrix to feature in 100 worst performing cities worldwide, ranking at number 61 out of more than 1,060 destinations. According to Inrix’s data, locals spent an average of 43 hours last year stuck in traffic. 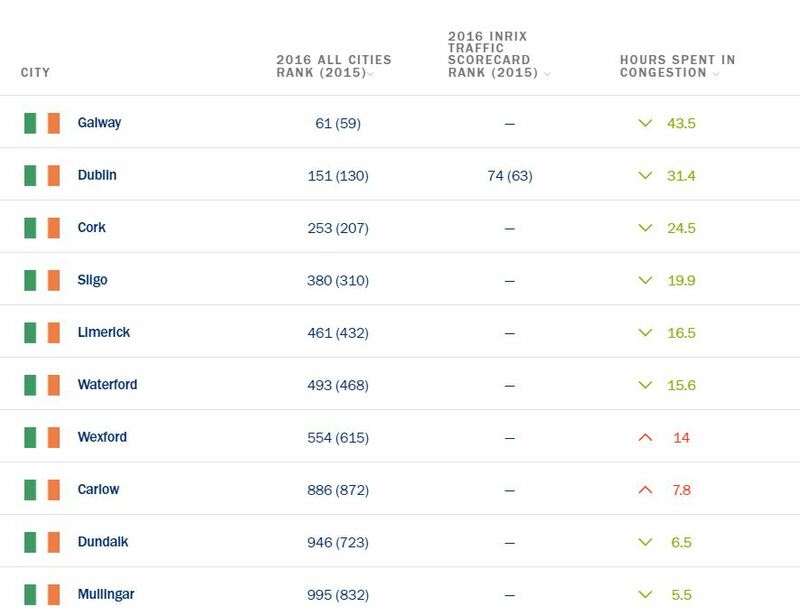 For comparison, Dublin ranked 151st, with drivers spending 31 hours last year in traffic. Cork came in at 253rd. A spokesman for Galway City Council’s roads and transport department confirmed that the city has experienced an increase in commuter traffic “since the recessionary lows of 2010, 2011″. Citing anecdotal evidence from biennial chamber surveys, O’Gorman said local business owners have had to offer flexible shift times to staff so that they can get to work on time. He claimed that the congestion problem has also cost Galway business from multinationals in the area. O’Gorman also said that real business is being loss to other towns and the tourist trade is under threat as well. The traffic problem has been exasperated by the thousands of workers commuting to and from Galway Business & Technology Park, which is locally referred to as Parkmore and is located on the east side of the city. The 38-hectare park is home to “many high-end manufacturing and international services clients”, according to foreign direct investment agency IDA Ireland. Around 15,000 people work there. Fianna Fáil councillor Peter Keane said the traffic problem is unacceptable, but that the city council has introduced a transport strategy that outlines how the issue will be tackled in the short-, mid- and long-term. The city council will in January of next year submit a planning application through An Bord Pleanála to build a €600 million outer ring road that will divert traffic away from the city centre. A previous bypass route was blocked by the European Court of Justice in 2013, which ruled that it would breach environmental rules. Around €14 million was spent on that proposal. Keane is hopeful the new submission will be approved because it falls under IROPI, or ‘imperative reasons of overriding public interest’, so an application can be submitted directly to the planning board. However, he said that even if planning is approved, it’s unlikely the project will be finished until 2024. To help alleviate the problem over the next six years, the city council has recalibrated the sequencing of traffic lights at key areas like Parkmore and Briarhill. “We’ve changed up the junctions in terms of where the lanes go. We are seeing improvements where that is concerned,” Keane said. The transport strategy also includes plans to introduce a park-and-ride facility off the Coolock roundabout, which will accommodate up to 800 vehicles and provide a bus service to and from the city. O’Gorman said that Galway Chamber members understand that traffic management “has its complexities”, but they are concerned that the funding may not be available to fulfil the proposals. “The transport strategy that came out would require something in the region of €10 million to €15 million a year over a five-year period,” he said.